The America Invents Act (2011, H,R. 1249), the first patent law reform in 60 years has started its rule making process. Surprised? There’s a new patent law in the U.S. and it did get done under the radar of much of the economy unlike other revolutions over the past few years. 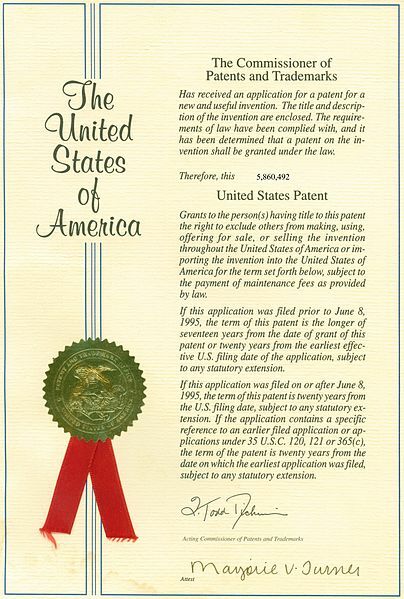 US Patent Cover Page Example. From Wikipedia. Click image for the largest view. In typical Congressional style of dodging the real work of making statute and following up on the responsibility the America Invents Act contains twenty different statutory provisions and steps for the USPTO to implement in a variety of ways. Somehow the “under the radar” thing is still in play. Janet Gongola, Patent Reform Coordinator for the U.S. Patent and Trademark Office (USPTO), describes the process of implementing the America Invents Act in the current issue of Technology and Innovation- Proceedings of the National Academy of Inventors. Naturally the site is not serving the article at this writing. A quick look over what little there is to see on the site makes one wonder how and why, that place of all possible places, was chosen. Actually, this rule making process is of huge national economic importance. The bill was a bipartisan sponsored effort backed by special interests and flowed with “international harmony” the prime source of the impending disaster the new law sets up. Simply put the new law is a fundamental change reversing a root basis for innovation by switching the U.S. patent system from a “first to invent” to a “first inventor to file” system. This change has immense implications about intelligence vs. knowledge. The intelligence to invent and innovate is now trumped by knowledge of the intelligence and then acting. The concept of first art, or being able to document an idea places the ownership equity in the hands of the intelligence who made it. First to file puts the ownership equity in the hands of anyone willing to act by filing – whether or not the filer has any intelligence at all. That’s the way almost the entire world has been doing patents for about a century. It’s also why the whole world has followed the U.S. technical lead. First to Invent is the foundation of the U.S. and its economic allies wealth. It will be gone March 16th 2013 if nothing is done. The above overview is quite simplified. With intense security, considerable wealth for patent attorneys, and no need to attract capital an inventor, researcher or scientist could still benefit from their intelligence. Realistically, the law puts U.S. inventors on the same footing similar to other nations’ patent systems on which the bill was modeled. For universities, venture capitalists, new business formation, angel investors, job growth, wealth formation and tax base increases the new law is a disaster. Just like all those other countries who thought first to file was a bright idea. The American Dream has just taken a major hit. The Canadians changed from First to Invent to First to File in 1989 and experienced a measurable “adverse effect on domestic-oriented industries and skewed the ownership structure of patented inventions towards large corporations, away from independent inventors and small businesses. But that’s not the worst of it. The deep research in universities will be extremely risky and over the next few years funding options will shrink. To feed the family so to speak, a fair rush of resumes will soon be heading out into the private sector – and not to small business – in the midst of a recession. With no particular surprise the new law essentially overlooks the “patent troll” specialists, entities that simply look for patents they can swipe by means lawful, using lawful means or simply behaviors that wipe out a patent holder. As a practical matter funding may become something of a troll itself, looking for a concept that can be patented without any real regard to the inventor or researcher. Things will change. The most devastating change is the value of intelligence has plummeted and bureaucracy value of paper, documents, lawyers and position in large organizations has soared. It’s an odd choice for a free country where the individual is thought to be supreme. Of course the constitutionality issues (pdf) may overturn the whole mess. Meanwhile in less than a year, and your humble writer could be wrong, but those with the knowledge (or just an idea, workable or not) and file will push the inventors away from the fruit of their gifts. Congress, the witless tool of special interests has handed over a cornerstone of the economy to special interests. There were bound to be good intentions, but not one problem was solved – only a poorer situation was developed for the entire country and the world. There was very little disagreement with this bill as it pass through congress . I agree that there will be unintended consequences. This posting is so unjustifiably alarmist, one-sided and uninformed that I cannot invest further effort in crticising it. Thanks for reading through, Dave. The perspective you’re using is unjustifiably conformist, one sided and short sighted it begs me to make a counter statement.